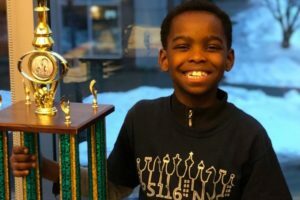 A homeless 8-year-old Christian refugee, Tanitoluwa Adewumi has won New York State’s primary chess championship which has resulted in thousands of dollars donations given to help find a home for him. Christian Post reports that Tanitoluwa and his family fled persecution in 2017 from Islamist sect Boko Haram in Nigeria and are currently living in a homeless shelter in Manhattan. Tanitoluwa, who is fondly called Tani started playing chess a year ago and is now the new state chess king of the kindergarten through third grade level, defeating children from elite private schools with private chess tutors. In another development, an organization that helps persecuted Christians in 60 countries, Open Doors USA described the nature of violence Tani and his family fled, adding that the attack on Christians often left them helpless and defenseless. Makofsky launched a GoFundMe campaign two days ago to help raise fund for Tani’s family to get a home and as at Monday morning, about 1,400 people had donated almost $100,000. This entry was posted in Charity, Christianity, Faith, News, World and tagged GoFundMe, Open Doors USA, Tanitoluwa Adewumi. Bookmark the permalink.